Not all species of snakes are the same, and many of them differ even in their reproductive patterns. Boa constrictors, for example, do not lay eggs and instead welcome live young into the world. These massive reptiles, unlike pythons, are classified as being ovoviviparous, which means that their eggs emerge inside of the body -- specifically within the oviduct. Since boa constrictors are ovoviviparous creatures, their offspring come into the world already alive, since they come out of eggs located inside of the mother snakes' bodies. The embryos make developmental progress internally. Because wee boa constrictors enter into the world "alive," they are generally very quick to become self-sufficient. 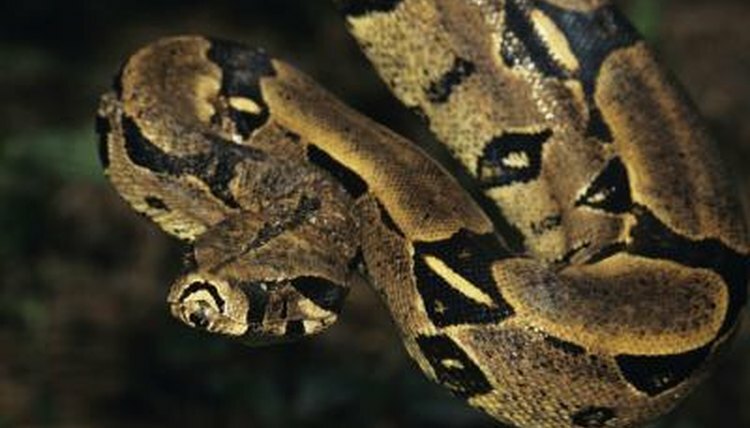 Fertilization takes place internally for boa constrictors. While offspring grow inside of a boa constrictor's body inside of eggs, they are directly connected with a yolk sac and enveloped within a clear-colored, tenuous membrane. They remain in this state for a few months, steadily growing and making progress. When birth is impending and the youngsters are about to exit their mother's body, these defensive membranes promptly break. The boa constrictor breeding season typically lasts between the months of April and August, when the weather is especially dry, according to the University of Michigan's Animal Diversity Web. Both male and female boa constrictors may have several different mates during a single reproductive season. Boa constrictor mothers experience a gestation period that lasts for approximately 100 to 150 days. Once the young are physically formed, they leave the confine of the mother's body via the cloaca cavity. The litters typically consist of approximately 25 baby snakes, but have a range of anywhere from a mere 10 to a massive 64 little ones. Through pure instinct, young boa constrictors generally have the ability to stay alive from day one. Since the internal embryonic development of the young is rather physically taxing and strenuous for the mother boa constrictors, it is crucial for them to have time for healing after birth. Without healing, the mother snakes are not capable of adequately replenishing their fat supplies.